BSNL Recruitment Notification 2018 19- Bharat Sanchar Nigam Limited (BSNL) has rolled out a recruitment notification for the 300 posts of Management Trainee in the sub-department Telecom Operations on their official website, i.e. bsnl.co.in. Candidates can now apply online for this BSNL Recruitment 2018 by carefully going through the article and checking if they qualify for all the eligibility requirements of this BSNL Job. The BSNL MT recruitment and its various details are enlisted below in the article. Details include BSNL Eligibility Criteria, Selection Procedure, Application Fee and more. We have also provided the direct link to apply online for the BSNL Recruitment and the BSNL Official website for the candidates in case they need to refer to something. Candidates can start the registration from the 26th of December onwards and the last date to apply online for the recruitment is 26th January 2019. So, candidates are advised to apply online way before the deadline to avoid hurry. This recruitment is an amazing opportunity for engineers who are looking for a job in the BSNL. This will be a golden chance for all those who might be searching for a vacancy in any one of the govt sectors of the country. Furthermore, candidates who have an MBA are also given this prospect of getting into one of the most stable parts of the govt recruitment sectors- BSNL. 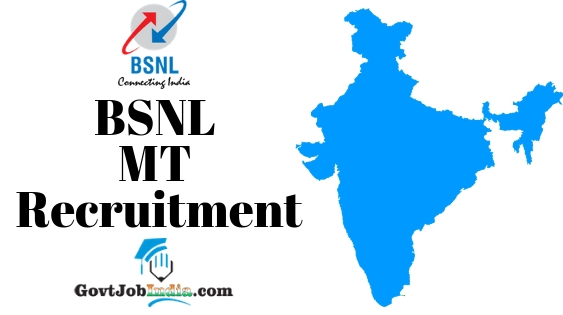 Here in this article, as we mentioned above, have given all the details pertaining to the BSNL MT Recruitment 2019. So, we suggest you move on with the article by going through the details enlisted below. Note: The date of birth mentioned on your matriculation certificate is the date of birth that will be taken into consideration while determining age eligibility. Minimum Qualifications Degree in Engineering/Technology with minimum 60% marks and MBA/M.Tech. How To Apply Online For BSNL Recruitment 2018 @ www.bsnl.co.in/ recruitment 2018? Candidates who wish to have this amazing opportunity of getting a govt job in the BSNL must follow these steps in order to get through the recruitment application process. So, given below are the various steps to get through this procedure. OR consequently, you can go to the link given below and apply directly from it. But unfortunately, the application form hasn’t been made available on the official website as of yet. Since the application form isn’t available, you will not be able to fill the form completely, but when it is made available, this is how you will fill the form. On the page which comes up (when it comes up), start by entering all your information on the online application form. Carefully complete the application form by filling in your details and attach all your required documents onto the form. This must be exactly according to the measurements sent in by the BSNL recruitment notice. Pay the application fee according to your category and submit your form. Save the fee receipt of the payment of the fees and keep it safe. Also, note your recruitment id and save it for further uses. Did you find this article about the BSNL MT recruitment useful? Ensure that you share this content with all those who are looking for this information and might benefit from this opportunity. Furthermore, comment down below if you have any doubts related to the same. So, in conclusion, we would request you to subscribe to our website @ GovtJobIndia.com for any updates about any govt job recruitment.